SINGAPORE — Satellite operators in Asia say the debate over C-band in the United States is triggering similar discussions in their markets, causing concern that cellular operators could end up in control of the spectrum in other parts of the world. While next-generation 5G networks are nearing deployment in the U.S., Europe and other technologically advanced areas like South Korea, several operators argued that most of Asia is still developing and has strong need for C-band satellite services. 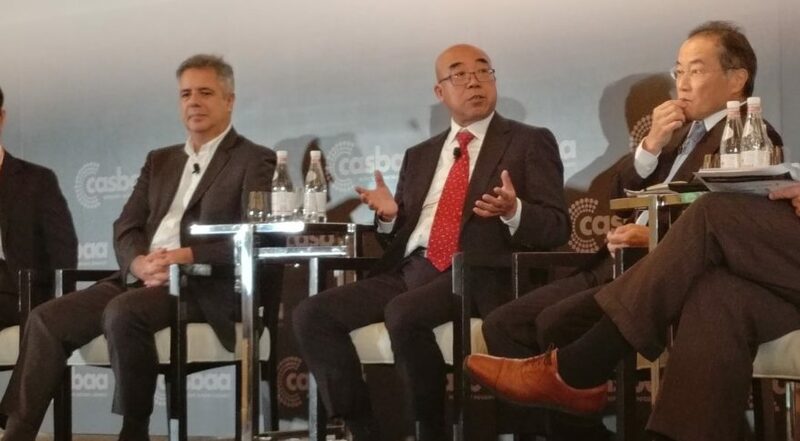 “My personal belief is that Intelsat sold out the industry,” Roger Tong, AsiaSat’s recently appointed CEO, said at the CASBAA Satellite Industry Forum here June 25. Intelsat and Intel have proposed letting 5G networks use some C-band spectrum in cases where it is strongly needed provided cellular operators compensate satellite operators for transition costs and lost business. SES backed Intelsat and Intel’s proposal when they agreed to clear only 100 MHz of the band instead of all 500 MHz allocated for satellite in the U.S. The U.S. Federal Communications Commission included some of Intelsat and Intel’s suggestions in a notice of proposed rulemaking it issued June 21 in preparation for a July 12 vote. Baozhong said he fears the 100 MHz offered to mobile network operators is unlikely to be enough. “They will take another 100 or 200, [until] finally all the C-band will be gone,” he said. “What’s happening in the U.S. is having an impact in our region,” said Clare Bloomfield, director of policy and research at the Cable and Satellite Broadcasting Association of Asia (CASBAA). CASBAA has consulted several governments including the Philippines, Singapore, Hong Kong, India and Australia on C-band, she said. Jim Simpson, CEO of ABS, said cellular companies are striving to convince telecom regulators across Asia that they need C-band more than satellite operators — a claim less easily defended in Asia because of the spectrum’s ability to get signals through rainstorms better than Ka- and Ku-band. Jean-François Fenech, CEO of Eutelsat Asia, disagreed with other panelists, saying he doesn’t foresee a fight over C-band coming to Asia. “The good thing I observe is many of the countries have national satellite systems which are operating in C-band, so I don’t see how they would shoot in their own foot if they believe satellite in C-band is good for them,” he said. India’s GSAT-17, Laos’ LaoSat-1 and Bangladesh’s Bangabandhu-1 satellite — all launched within the past few years — carry C-band payloads for telecom services in Asia. Last year Eutelsat also launched a satellite — Eutelsat-172b — with C-band coverage of the Asia Pacific. Sky Perfect JSAT’s Mitsutoshi Akao, executive officer and group president of the Japanese operator’s Global Business Group Space & Satellite Business Unit, said the Japanese government likes to follow U.S. decisions, and that his company is discussing with the Japanese government the importance of C-band. Several Asian satellite operators argued that the situation in the U.S. differs strongly from the situation in Asia. However, both have one thing in common — insufficient data on how widely C-band is actually used. “Worldwide we really don’t know how many C-band receive-only antennas there are,” Baozhong said. A Chinese study from 2007 found more than 20 million C-band dishes in use, he said, but the current number is unknown. Fenech estimated Indonesia has 10 to 13 million C-band dishes for television broadcast services. JSAT’s Akao said the number of C-band dishes in Japan is “small,” but still important.